Jeanette Terry of Wild Abandon Kitchen is joining us today to share one of her favorite winter recipes! It’s not only sweater weather, it’s winter squash weather. I love the robust fall flavors in this recipe. Sweet roasted squash paired with savory sausage and tart cranberries is my idea of fall on a plate. You could easily adapt this to use your favorite sausage variety. Or switch the acorn squash for butternut. Add in walnuts or pecans for some crunch. Or go wild and top with Parmesan cheese for a little salty crunch. It’s a great method to use all season long. Preheat oven to 400 F. Slice squash in half. Remove seeds and pulp. Place cut side down in baking dish or sheet pan and roast for 30 minutes or until tender when pierced with a fork. Meanwhile sauté ground sausage over medium heat until no longer pink. I use spicy Italian sausage, but use your favorite. Mild Italian, maple breakfast sausage, or chorizo all work well. Add diced onion and sauté additional 3-5 minutes until soft. Add spinach and allow to wilt. Season with salt and pepper as needed. Turn off heat and add cranberries, breadcrumbs, milk, and egg. Stir to combine and spoon into each squash half. Return to oven and bake 25-30 minutes more. You can find Jeanette online at wildabandonkitchen.com or @wildabandonkitchen. Jeanette Terry from Wild Abandon Kitchen is joining us today and we're talking tomatoes! Here's Jeanette's recipe for summery tomato pie. Tomato season is upon us and our house couldn't be happier. 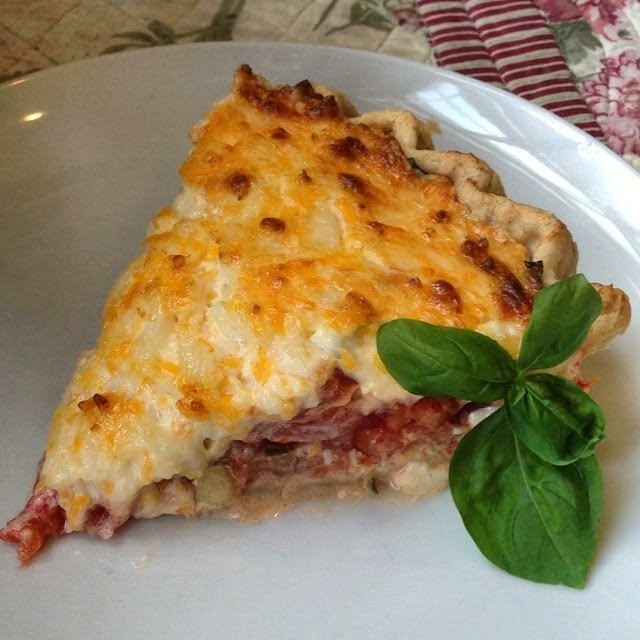 While a BLT or even just sliced tomatoes as a side dish are an easy way we enjoy these summertime beauties, every now and then I treat us to this decadent tomato pie recipe courtesy of Paula Deen. It's rich and delicious and a definite treat. ***I typically make my pie shell from scratch, but store bought shells work very well in this recipe also. There is almost nothing better in a Southern summer than fresh peaches. Jeanette Terry from Wild Abandon Kitchen is joining us today to share an incredible recipe for grilled peaches. With summer in full swing, the temperatures are rising, but the produce is rolling in. Peaches are one of my favorites in the summer and this light dessert doesn't require turning on my oven in July, a definite winner in our house. Brush peaches lightly with oil and grill 3-5 minutes over medium heat flesh side down. You can also do this in a cast iron pan if you haven't fired up the outdoor grill. Top peach halves with a drizzle of honey, goat cheese, almonds, and basil. In this case I used Thai basil because I had an abundance of it in my herb garden, but sweet Italian basil works just as well. And that's it. A simple dessert. Not too sweet. And not too much work. That's my kind of summer style.